Check out the "SP" high output version of the popular Efini twin turbo package. Similar to the original Efini turbos but with a little more "punch". A slightly larger wheel on the compressor side of both turbos allows them to move 12% more air for a nice boost in maximum power. The newest Power FC computers are here and include the new OLED type commanders. Check them out along with the Pro-Tuner kits that we now carry. Click for more details. 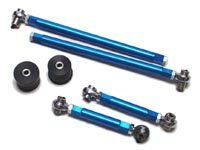 Our traction kits and suspension components continue to provide the best value for the serious 3rd gen RX7 driver. They've been out selling the competition, because they work. Built in the US using first quality componets and the best alloys available, check them out for yourself. Click for more details. We just received the updated Version (V2) of the classic "Aluminum AST". 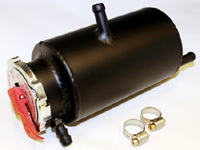 These air separator tanks feature a billet filler neck for a reliable, positive seal. The updated design improves the separation of air bubbles from the coolant by creating a "swirl" effect inside the tank. They are black powder coated for a durable finish. We recently received a shipment of FC-Datalogit X USB kits. Get yours before they're all gone. Click for more details. © 2018 RX7.COM. All Rights Reserved. Please direct comments or concerns here.